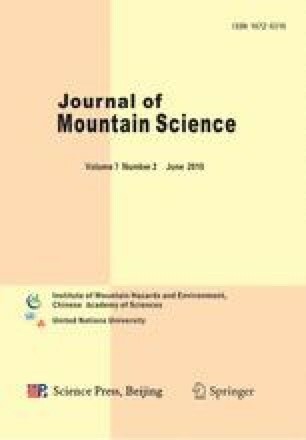 Based on the pollen data obtained from thirty-five surface soil samples and investigated vegetation data from seven plant quadrats, the quantitative relationship between surface soil pollen and modern vegetation are studied in the longitudinal range-gorge region (LRGR) in Southwestern China. R-values (referring to pollen assemblages) are calculated with pollen percentage and plant abundance. The coefficients of similarity between pollen and vegetation are analyzed. The results show that the pollen assemblages on surface soil of all vegetation zones can basically represent the native vegetation, but the pollen assemblages are not fully according with the vegetation. This is due to the influencing factors including pollen preservation ability, pollen production, amount of exotic pollen and pollen identification. The pollen representation in surface soil is different in families and genera. The pollen of woody plants such as Pinus, Tsuga, Alnus, Fagus and Castanopsis are over-representative, but those of Quercus, Carpinus Myrica, Elaeocarpaceae, Ericaceae, Theaceae and Llex are underrepresentative; the pollen of herbaceous plants such as Artemisia and Rubiaceae are over-representative, while those of others including Gramineae and Araliaceae are under-representative. The R-values of the same taxon pollen in different vegetation zones are different, depending on their distances from the pollen sources. The coefficients of the similarity between plant communities and pollen assemblages are mostly over 70%, which indicate again that the surface soil pollen and spores assemblages can represent the vegetation. It is concluded that there is a good corresponding relationship between surface pollen assemblages and native vegetation in LRGR, and it is of great significance for reconstructing the past vegetation and paleoclimate using quantitative fossil pollen data in this region.